Elah and our Champion herdsire, Sir Titus had a beautiful rose grey female last spring....and now they have done it AGAIN! 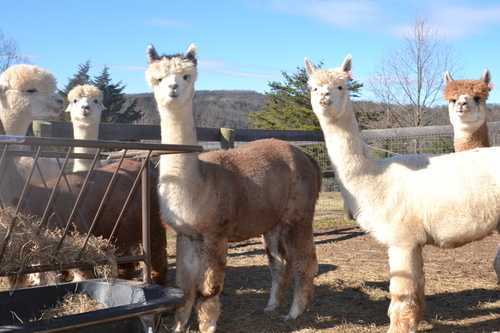 Their 2010 offspring, Contessa is now proudly residing at Mystic Mountain Alpacas in Covington, GA. The 2011 edition can be seen here...lovely Teressa. This young female gets more beautiful by the day! Elah is a favorite here on the farm, her sweet, inquisitive disposition and little panda bear face just makes you smile. Elah came from great stock. Her sire, Highland Dunvegan, is a multiple ribbon winning full Peruvian male with beautiful fleece. He took second place at the AOBA Nationals in 2002 & 2003. Elah?s dam,RK Maya Angelou,is a wonderful mother to her 5 daughters, Mi hija now of Alpacas of Misty Ridge WA, Sunday Rose & Glory now of To His Glory Farm NC and RK Miraposa residing in Calera, Alabama. Maya's ribbons include 2003 4th place at the very competitive Southern Select show, 3rd place at the 2003 KY Classic and 4th at 2004 Fiber to Fleece show. Elah?s grandsire 5Peruvian Silverado 9042 needs no introduction. 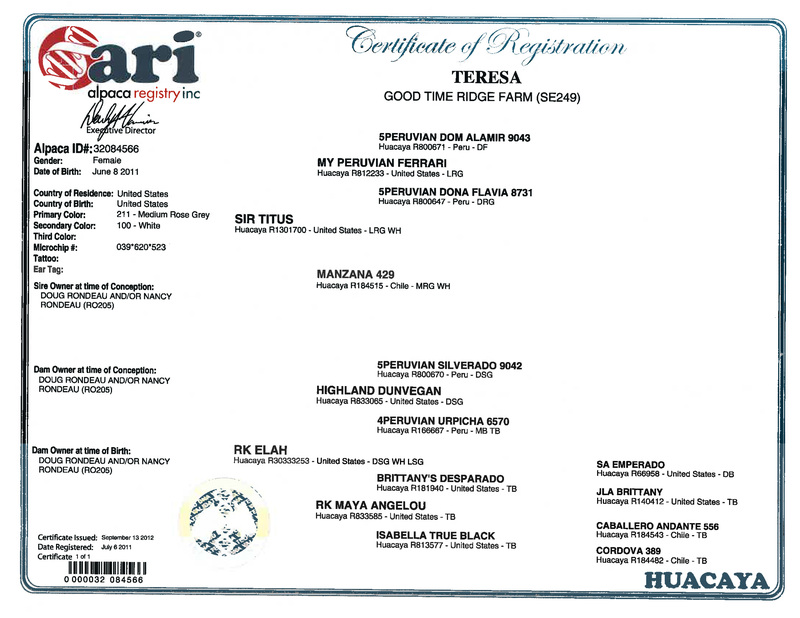 Her grand sire on her dam?s side is Britney?s Desperado an AOBA Blue Ribbon winner as is her grand dam, our Isabella, also a Blue Ribbon winner at the 2002 Southern Select Show. In addition to RK Contessa and Teressa, Elah's first cria, RK Raphael sired by our Champion herdsire, Crockett is beginning his breeding careeer in Florida. See his picture below! 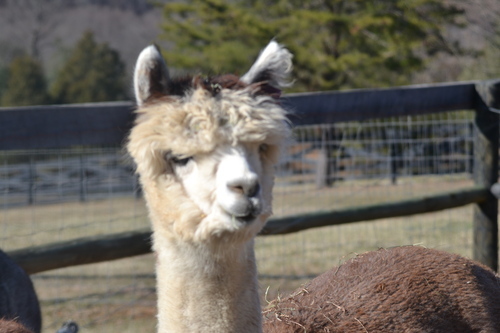 Come visit the farm and meet Elah, the adorable one along with her stunning daughter. Should we do it again...Titus and Elah? Bring an offer on these two fine females and maybe the decision can be yours! This girl is soft soft soft. She is due with a Snowmass Atric Blue cria this spring.